You don't notice it as you first enter the Meat Market, but then a shadow catches your eye and you stop and take a second glance. And it's then you see a figure cloaked in a black gown, head down slowly walking in the darkness around a circle of light. 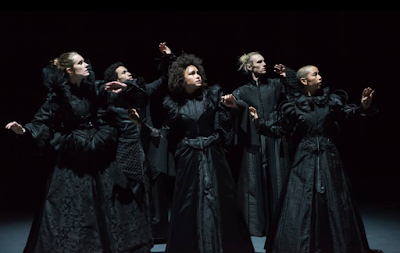 And then you see another, and another, and another, until it’s all you can see, and you wonder how you didn't see them in the first place, which is the perfect way to describe the thoughts and themes explored in Lucy Guerin's brilliant dance work, The Dark Chorus. Presented as part of Melbourne Festival, the show is an intimate look at the darker thoughts and voices in our heads and how they can consume us. Throughout the performance, The Dark Chorus can be heard whispering and chanting and while you can only make out some of what is being said, feelings of dread and fear slowly seep inside you. Guerin's choreography is a juxtaposition of strength and weakness, of resilience and fragility. The five dancers (Benjamin Hancock, Stephanie Lake, Jessie Oshodi, Lilian Steiner and Tyrone Robinson) are incredibly committed and keep perfect time with each other in some complex and fast moves that demand much from their bodies. Hancock is a particular standout with extensions and flexibility that need to be witnessed and possesses strong control throughout some difficult and testing choreography. The atmosphere in the large performance space is expertly created by Paul Lim’s lighting design, with one large overheard spotlight pointing down onto the stage being - for the most part - the only source of light in the show. The chorus walk around it, never entering into the circle and it’s only when the dancers remove their black cloaks (beautifully designed by Harriet Oxley and Benjamin Hancock with Chorus costume design by Jack Hancock) that they may enter. Yet even when reduced to plain white shorts and singlets - baring themselves to be free - the shadows illuminated on their face and body sends the message that they are still haunted and plagued by these thoughts; that there is no escape. The tense composition by Robin Fox further supports the tenebrosity of The Dark Chorus with various sounds and music dropping in and out, creating a strong feeling of unease and never quite knowing what is going to happen next. The Dark Chorus is within us all and for some it is less obvious and overpowering, but the struggle is always present. The meaning behind a show such as this will always come down to interpretation and what you choose to derive from it. Upon walking out of the performance, my initial response was one of bleakness and despair but upon closer reflection I found a sense of hope in The Dark Chorus, one that reached out to me, that told me this isn’t a losing battle.